The number four horse was a big gorgeous chestnut named Chameleon. He looked eager to run, his muscles rippling underneath his coat, which glinted coppery red in the fading afternoon sun. The colt moved restlessly in his enclosure in the paddock at Edgewater Downs, where trainers and jockeys conferred before the call of “Riders up!” The horse’s groom, a Hispanic man who could have been any age between thirty and fifty, checked his movement. The horse’s trainer was a young woman with a mop of curly brown hair. She wore tan slacks, a green shirt, and a brown tweed jacket with leather patches at the elbows. Her only accessory was a sky blue scarf with a dull green border. 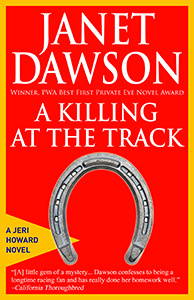 The colors of her scarf matched the silks her jockey wore, sky blue with narrow green stripes running down each sleeve. The jockey himself was at first glance impossibly small and slender in contrast with the big chestnut he was to ride in the upcoming race. Then he turned and I saw muscle and sinew in his hands and arms. His face was tanned, partly obscured by a shadow angling from one of the enclosure’s upright supports. I looked down at the program I held, running my finger down the list of entries for this race, the seventh. It was a contest for three-year-old colts, the distance a mile, and there were eight horses vying for a $58,000 purse. Chameleon’s trainer was also the horse’s owner. Her name was Molly Torrance. The jockey in the sky blue silks was Deakin Kelley, and for some reason that name rang a bell. But I wasn’t sure why. According to the check marks I’d made on my program, he’d ridden in three other races today, and had crossed the finish line first in one of them. Four out of seven races, some of them one right after another, might seem like a killing pace, but riding most of the races in the card meant the jockey was popular with trainers, one who could be relied on to try his best to finish in the money. Maybe Kelley was one of the up-and-comers. I must have encountered his name in a newspaper or magazine, although I didn’t as a rule do more than glance at the sports page. Or perhaps there was another reason his name was familiar. At the moment, however, I couldn’t recall why. Post time was four p.m., which meant I had about ten minutes to place my bet. The riders were up on their mounts now, perched on their tiny saddles with their feet in the irons, their knees up. Out on the track they assumed the hunched-over riding posture and began warming up their mounts. “I like the looks of that number four horse,” I told the man standing next to me as we turned away from the fence surrounding the paddock and headed back through the grandstand. He was tall and lanky, with gray eyes over a hooked nose and tousled hair that was turning silver, despite the fact that he was only in his late forties. David was a confirmed horseplayer, one who wouldn’t dream of betting until he’d done his homework, as he called it. From what I could tell, that involved studying the performance charts in the Daily Racing Form before he even got to the track. When he’d unfolded it earlier this afternoon, I had noted with amusement that he’d scribbled cramped hieroglyphics in the margins, all in red, green and blue ink. When David discovered I was the kind of infrequent bettor who wagered because I liked the way a horse looked, or because of the jockey, he shook his head and told me I might as well close my eyes and point. Then he’d launched into a brief lesson in handicapping. The first object, he said, was to eliminate the horses that had limited or no chance to win. Then all you had to do was figure out which horse might have a chance to cross the finish line ahead of the rest of the pack. He talked about speed, distance, surface and track conditions. Those I understood. I was a little shaky, however, when it came to points of call, fractional times, the significance of workouts, and something called Beyer figs, which evidently did not grow on trees. These statistics, with their strange cryptic notes and columns of numbers, seemed as remote a language as Sanskrit. “Odds,” I repeated. That was more gobbledygook. I didn’t understand how they figure odds either. I just knew that 30-to-one, the odds on the colt I’d bet in the last race, meant that the horse was a long shot. The odds on Chameleon were nine-to-two. Even with my limited knowledge of playing the horses, I knew that was longer than the odds on either Wall To Wall or Kilobyte. David had informed me that a horseplayer never made any money betting on favorites, and that much I could see. As a rank amateur, I really did like to bet on long shots. I’d bet on plenty of them in my time, and some of them had paid off. Chameleon was in the middle of the wagering pack, according to the probable odds listed in the program. “Dumb luck,” he said, heckling me. His smile grew broader, with more than a hint of devilment in his eyes. “I’ll go with you.” He unfolded himself from his chair. We headed back inside the clubhouse to place our bets.